To ensure that the insight of knowledgeable local fishers is always directly represented at the annual meetings of the Gulf and Caribbean Fisheries Institute, the Board of Directors approved the creation of the GMA in 2004. This award provides full travel funding for exceptional fishers to attend the annual GCFI conferences. Gladding was a model of the commercial fisher who became a profoundly influential conservationist. His vision of responsible fisheries management from the industry perspective helped lead to the establishment of the Tortugas Ecological Reserve. Each annual recipient is selected by a GMA subcommittee composed of several GCFI trustees and one or more past recipients of the award. Fishers from around the Gulf of Mexico and the wider Caribbean Basin are eligible for the award. Each year the full board of the GCFI is solicited by the subcommittee to forward the names and rationale for likely candidates. Any GCFI member or fisher in the region is also welcome to suggest names, preferably through a board member with some familiarity with the fisher or the proposer. The GMA subcommittee subsequently evaluates the submissions and chooses the final award winners based on the fishing experience and the conservation actions of the candidates. Given the wide geographic, cultural, and language diversity of the region, every effort is made to ensure that winners represent the full geographic range of the region. To date, recipients come from Antigua and Barbuda, Barbados, Belize, Bermuda, Colombia, the Dominican Republic, Florida, Guatemala, Jamaica, Mexico, Puerto Rico, and Venezuela. The more formal inclusion of fishers into fishery management conferences is overdue. 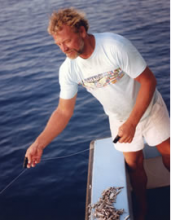 The membership and board of GCFI are therefore pleased at the Gladding Memorial Award’s early success in fostering creative initiatives to put fishers shoulder-to-shoulder with scientists and managers. The award was initiated with grants and in-kind efforts from Environmental Defense and the Florida Keys National Marine Sanctuary; additional sources of funding have been provided by the United Nations Environment Programme – Caribbean Environment Programme and are encouraged to ensure the continued expansion of this initiative. Everyone who knew Peter recognized him as a unique individual who contributed greatly to conservation efforts. It took a decade, but his voice was very instrumental in getting Rileys Hump partial, then full protection. He then became the most profound fisher/MPA advocate many of us have ever seen. In recognition of Peter’s enormous contributions to the establishment of the Tortugas Reserves, NOAA/NMFS and Florida State University honored him with a special award from the Coral Reef Task Force. The plaque and letter are hanging in Peter’s living room. Peter left feeling that he made a difference in the world. Peter was one of the good guys and an incredibly knowledgeable individual. Many of us remember his good nature from the 55th GCFI conference in Xel Ha. Fellow fishermen joked that the pelicans followed Peter around to find the bait. He was bigger than life to many of us. His departure is a reminder of our own mortality and just how precious and short the one time gift of life is. He will be missed.